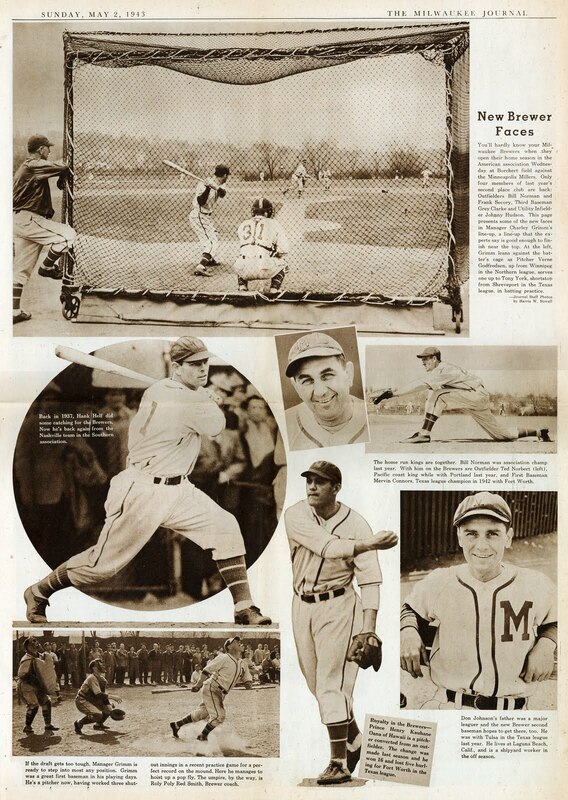 This gorgeous full-page photo essay, previewing the 1943 Brewers on the eve of their home opener, was published in the Milwaukee Journal on Sunday, May 2. This was during the period when wartime travel restrictions forced the Brewers to move Spring Training to Waukesha, so Journal photographer Harris W. Nowell didn't have to travel very far to capture the new Brews in action. You'll hardly know your Milwaukee Brewers when they open their home season in the American association Wednesday against the Minneapolis Millers. Only four members of last year's second place club are back: Outfielders Bill Norman and Frank Secory, Third Baseman Grey Clarke and Utility Infielder Johnny Hudson. This page presents some of the new faces in Manager Charley Grimm's line-up, a line-up that the experts say is good enough to finish near the top. 1943 was Bill Veeck's second season in charge of the Brews. He had already overhauled the team's uniforms, and following his first full off-season Sport Shirt Bill had made many changes to the team itself. Grimm leans against the batter's cage as pitcher Verne Godfredsen, up from Winnipeg in the Northern League, serves one up to Tony York, shortstop from Shreveport in the Texas League, in batting practice. These two men would have very different experiences in 1943. Ten days after Nowell snapped this photo, Vernon Godfredsen was optioned to the Portsmouth (Virginia) Cubs in the Piedmont League, having developed a "sore arm". Charlie Grimm blamed his injury on the cold Waukesha weather, which had forced the Brewers to curtail some of their Spring Training sessions. Tony York stayed with the Brewers all season, and was successful enough in Milwaukee to be sold to the other Cubs, those of Chicago, who moved him to their Pacific Coast farm club in Los Angeles. The uniforms worn on that day in Waukesha are the classic solid-piping, block "M" uniforms introduced in 1939. The large gap between two-digit numbers actually works on the catcher's back, allowing room right down the middle for his chest protector strap. 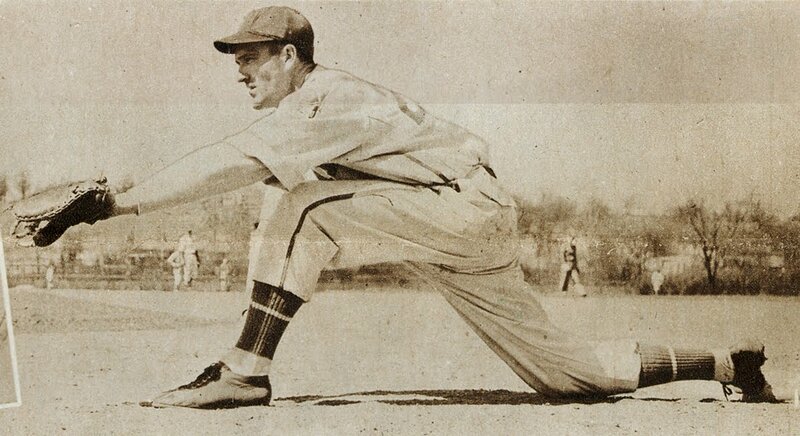 Back in 1937, Hank Helf did some catching for the Brewers. Now he's back again from the Nashville team in the Southern Association. As the Journal notes, Henry "Hank" Helf had been the Brewers' backup catcher six years earlier. While a third-stringer in Cleveland, he took part in a notable publicity stunt, catching balls thrown off the 52-story Terminal Tower to set a world record. The balls were tossed down to Helf from 708 feet up by the Tribe's rookie third baseman Ken Keltner, a Milwaukee native and former Brewer. 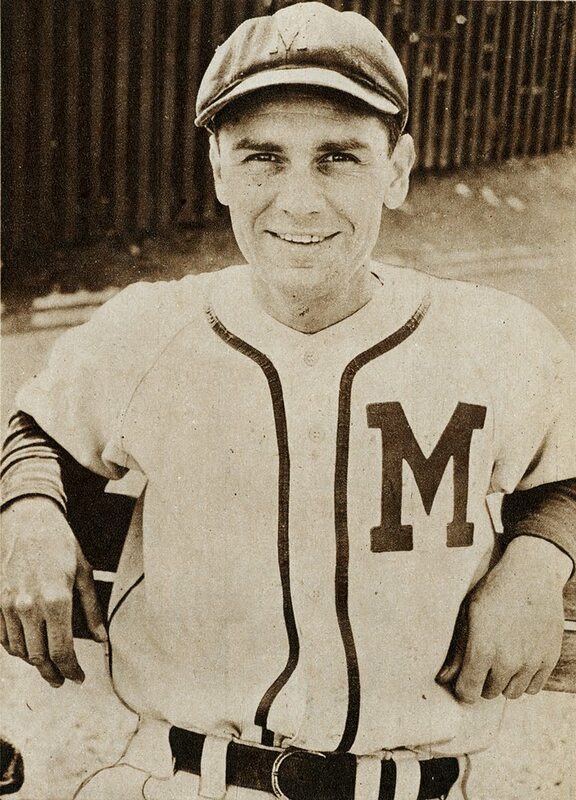 Helf's return to Milwaukee in 1943 was marred by an injury in July. After hitting .260 in 1943, Helf was drafted by the St. Louis Browns, but Hank ended up the navy instead. The home run kings are together. Bill Norman was association champ last year. With him on the Brewers are Outfielder Ted Norbert (left). Pacific coast king while with Portland last year, and First Baseman Mervin Connors, Texas league champion in 1942 with Fort Worth. Bill Norman, mentioned but not pictured, was one of the four returning Brewers from the 1942 team. He hit 24 homers in that season, good enough for the AA title. To put minor league slugging of the era in context, his fellow league home run champions Ted Norbert's 28 and Mervin "Merv" Connors's 27 were good enough for their respective league titles. In 1943, Norbert took the Brewers' home run crown with 25, and Bill Norman finished in second with 18. Merv Connors hit only 4, tied for eighth among Milwaukee sluggers. Connors is an interesting case. After the season, the Brewers filed a complaint against him for misrepresenting his draft status when he came north from Fort Worth. Baseball commissioner Kennesaw Mountain Landis, who had previously voided the Brewers' contract with eventual New York Yankees star Tommy Henrich, stepped in and ruled that Connors was a free agent. Royalty in the Brewers — Prince Henry Kauhane Oana of Hawaii is a pitcher converted from an outfielder. The change was made last season and he won 16 and lost five hurling for Fort Worth in the Texas league. Prince Henry Oana wasn't actually royalty, although he was native Hawai'ian on his father's side. Royal blood wasn't the only good story cooked up by his clubs' publicity departments; he was supposedly discovered by Ty Cobb on a barnstorming trip in Japan. Oana struggled on the mound in his single year in Milwaukee. He finished 1943 with a 3-5 recird and an ERA of 4.08. 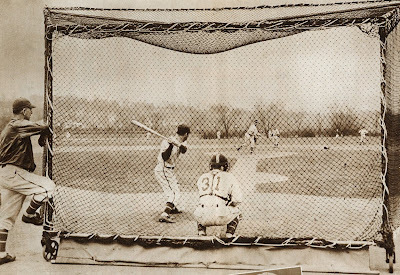 When it was his turn to step into the batter's box, he swung the bat like an outfielder. 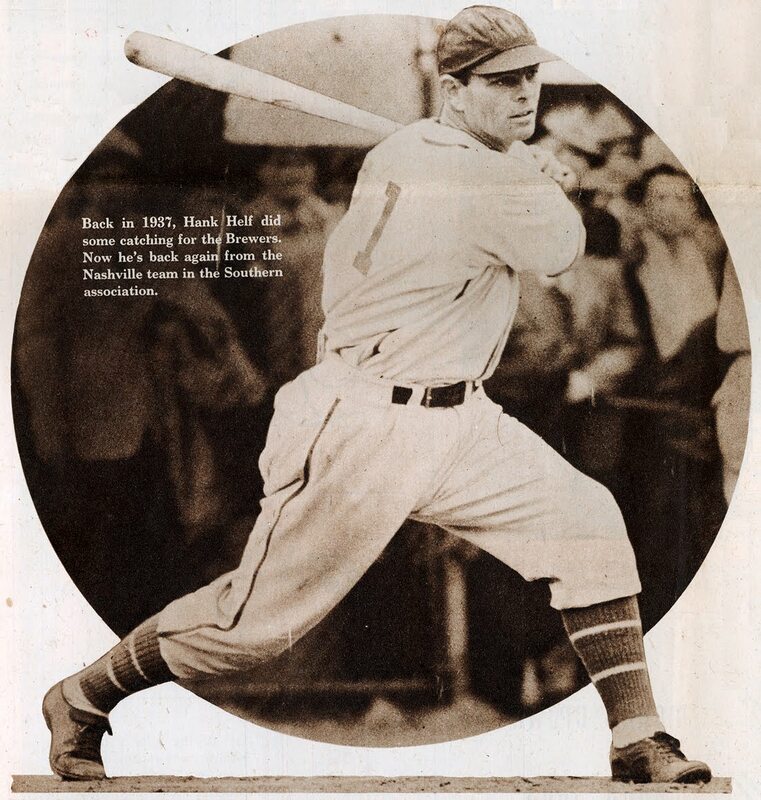 In his 20 games in 1942, the Prince hit .412. He was only in Milwaukee for a single season, but it was a tumultuous one. The Fort Worth Cats tried to recall him, claiming that a reclassified draft status gave them the right to take Oana back. Judge Bramham, minor league commissioner, ruled that the Brewers had to return Oana's contract to the Texas League club. Veeck protested, and appealed to a higher court. Judge Landis ruled for the Brewers (for once). Oana was ordered to report back to Milwaukee but refused. Veeck tracked him down by phone, convinced him to finish the year in Milwaukee, and sold his Hawai'ian prince to the Buffalo Bisons as soon as the season was over. Don Johnson's father was a major leaguer and the new Brewer second baseman hopes to get there, too. He was with Tulsa in the Texas League last year. He lives at Laguna Beach, Calif., and is a shipyard worker in the off season. As we've seen, being with the Brewers was good exposure to major league scouts, and Don "Pep" Johnson would soon follow in his father's footsteps. In September of '43, the Cubs bought him from the Brewers. He spent six good seasons on the North Side. If the draft gets too tough, Manager Grimm is ready to step into most any position. Grimm was a great first baseman in his playing days. He's a pitcher now, having worked three shutout innings in a recent practice game for a perfect record on the mound. Here he manages to hoist a pop fly. The umpire, by the way, is Roly Poly Red Smith, Brewer coach. Nice to see "Jolly Cholly" Grimm running out that popup. Good form. Of the four returning Brewers mentioned, Johnny Hudson was the first to go, being sold to the Jersey City Giants just eleven days after this photo essay was printed. Third baseman Grey Clarke was sold to the White Sox in September, although they allowed Bill Veeck to keep him in Milwaukee through the end of the American Association playoffs. Frank Secory played another year in Milwaukee, but moved up to the Cubs in August of 1944, after three seasons in a Brewer uniform. Bill Norman stayed at Borchert Field longer than the others before being sold to the International League's Toronto Maple Leafs in June of 1945. 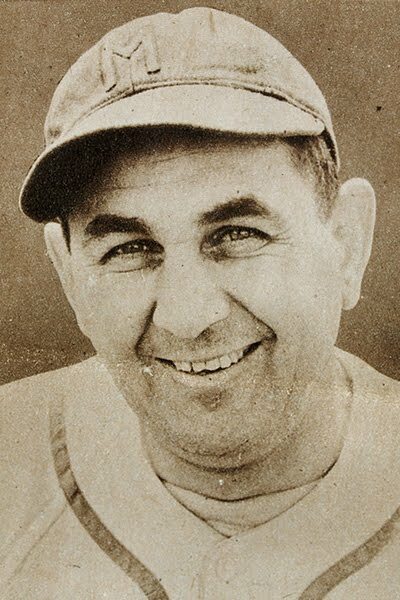 He took over the managerial reins the following season, and spent the next twelve seasons as a skipper, including two with the Detroit Tigers (1958-59). As for the 1943 Milwaukee Brewers, it appears that the "experts" were correct. They finished the season 90-61, five games ahead of second-place Indianapolis and bringing the American Association pennant (Veeck's first) to Milwaukee.